This beautiful hand crafted pasta is from Torino Pasta Company and derives its unique colors from natural ingredients. If you can’t find this type of pasta use regular bowtie pasta. 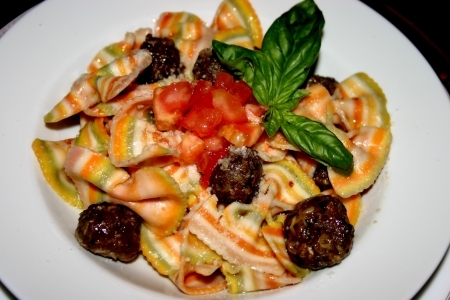 To properly showcase this beautiful pasta, I chose an Aioli sauce and added flavorful meatballs to complement the dish. Roasted garlic was used in the sauce, because it has a milder flavor than minced garlic. This will make 4 servings. The meatball recipe will yield easily 60 mini meatballs. You can cut the recipe in half, add all of them or let your family or guests snack on a few as they come out of the oven! Place the head of garlic on its side. Cut about a ¼ an inch off the top to expose all of the individual garlic cloves. Spray the top of the garlic with non-stick cooking spray and sprinkle with kosher salt and pepper. Place into a small baking dish and bake in a preheated oven at 300 degrees for 30 minutes. Remove once tender and set aside. For the meatballs, combine all ingredients and mix well using your hands. Roll into mini meatballs about the size of raspberries, no larger then a grape. Place onto a cookie sheet sprayed with non-stick cooking spray. Bake in a preheated oven at 375 degrees for 10 minutes. They are small and will cook fast, so check often. The bottoms of the meatballs begin to crisp at about 10 minutes. Remove and set aside or snack on a few as we did. Finely dice tomatoes and chiffonade the basil. Grate the ricotta if that is your cheese of choice. Set aside. Squeeze 5 cloves out of the roasted garlic and place into a blender or magic bullet. Add olive oil and salt and blend until well blended and has a smooth texture. Pour contents into a deep large skillet or a large pot. Simmer over low heat for about 5 minutes just to warm. Stir often so it won’t burn. Add meatballs, pasta and toss. Top with fresh tomatoes, basil and your cheese of your choice. Try Allegrini Palazzo Della Torre Veronese (Italy), Podere del Guiggiolo Corte alla Flora (Italy) or Masi® Campofiorin® Rosso Del Veronese (Italy).